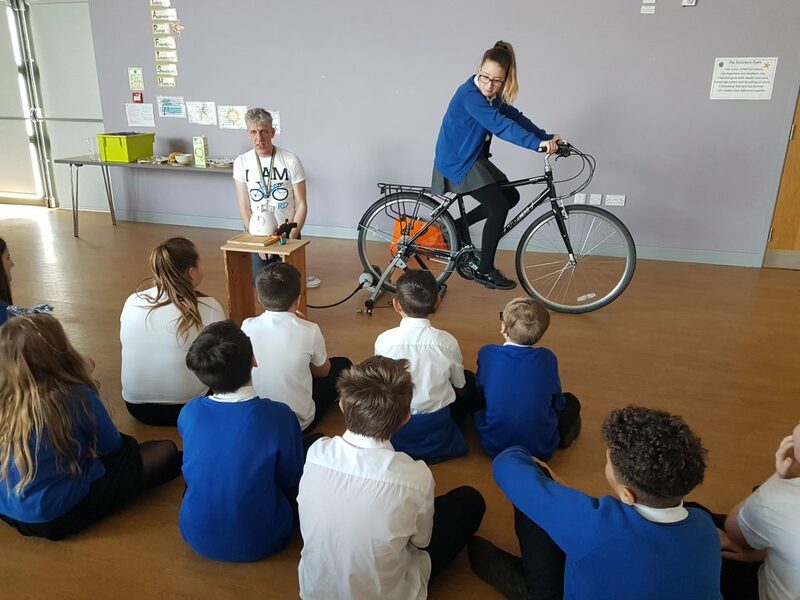 British Science Week proved to be the ideal opportunity to roll physical activity, healthy eating and sustainable living together using fruit, a food blender and a bicycle. Rob Bounds, School Travel Plan Officer at Derbyshire County Council explains; “Having achieved Modeshift STARS Gold, Dallimore Primary School are continuing to promote active and environmentally friendly travel to help remind and encourage children to carry on walking, cycling and scooting to school. As part of British Science Week the school chose “journeys” as their theme, with pupils looking at the journey of the cocoa bean, the journey of plastics and linking this with active and healthy journeys with the aid of a pedal powered smoothie maker. This also provided the opportunity to talk about forces, friction and moving, as well as environmental friendly sources of energy! 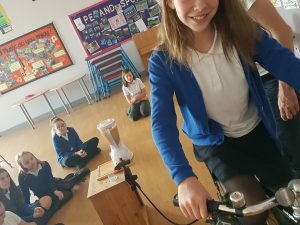 The whole school were involved from nursery to Year 6 – with each year group trying out a different smoothie recipe, including chocolate ones, all blended by bicycle. And of course to avoid using single use plastic cups, beakers and lots of washing up was the order of the day! 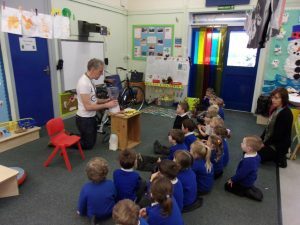 During science week we saw a man called Rob and he taught us how to make smoothies with a bike. In order to make the smoothie, we had to attach the blender to a wire that was connected to something that kept the bike stationary. While people were pedalling, Rob explained how we weren’t using any electricity whilst we making the smoothie so we were not using fossil fuels (petrol, oils and coal). We also saw that some ways of coming to school were more environmentally healthy than others; for example, going to school using car share instead of two separate cars was a lot better. By using two cars, you put more carbon-dioxide in the air which means that there is less oxygen in the air for us to breathe in. In the smoothie we put, some bananas, some mixed berries, some pineapple and put 3/4 of a litre of apple juice in too. Finally we got back to class and drank it. Guess the percentage of the class that liked it ?! Written by Ellena, a pupil at Dallimore Primary School.